The alignment of Moon, Mars and Venus on April 23. "I am hoping the spring stays quiet," says Elizabeth Warner, a faculty research assistant in the astronomy department, who looks forward to this semester's skies, but not the schedule that ensues. "But that might not happen if predictions for two bright comets come true... If C/2002 T7 LINEAR and C/2001 Q4 NEAT perform as predicted, we could have an interesting show in May." Warner doubles as the observatory director, when the 40-year-old building is open to the public, and co-curator of the observatory Web site. This semester, her main tasks include hosting the observatory's evening open houses twice a month, planning Maryland Day/Astronomy Day (which fall on the same date in April) activities and keeping an eye on the sky. "What is hard to determine is how bright two comets that will be visible will actually [appear]," she continues about the sky highlights this spring. "However, they probably won't be as bright as Hale-Bopp, which was visible in 1997. If they do get bright, be sure to check the observatory Web site for any special viewing sessions." Warner posts information about special observing events and observatory news on the site, where she said many visitors go for information about buying telescopes and joining local Web astronomy clubs. The site is also packed with monthly observing sights from Space.com and links to local air and space centers. "Most [people] are just trying to find out about the current programs, who the speaker will be for the next open house, what the weather might be, and what satellites are visible in the area," she says. In addition to maintaining the Web site, Warner also schedules events at the observatory, which draws 2,500 visitors a year. When the observatory is closed, Warner advises the amateur astronomer to scan the sky this spring for certain planets and constellations visible to the naked eye. On a clear dark night anyone can see the moon, meteors, stars, galaxies and comets. "Saturn and Jupiter will be the prominent planets. Orion and Gemini are the main constellations with Ursa Major and Leo becoming prominent in March... Of course, there's lots of constellations visible, but those are some of the 'brighter' and easier ones for people to recognize." According to Space.com, Venus will also be visible in the western sky this month. With repeated observation, sky watchers using telescopes can watch it changing phases after the sun sets. The neighboring planet, which is closer to the sun, will be brightest in mid-spring as it heads back towards the sun in early May. "There will be some beautiful photo ops with Venus. On Feb. 23 the new moon and Venus will be next to each other in the evening sky. Another chance will come on March 24. The next evening, the moon will be beside Mars. Then from about March 31 through about April 4, Venus will be skimming past the Pleiades [an open star cluster often mistaken for the Little Dipper]. 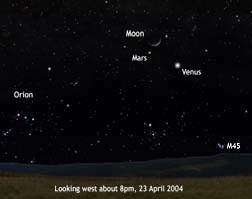 Then on April 23, another grouping with the Moon, Venus and Mars." These are some of the events Warner said she can predict people will be able to see with their own eyes on the western horizon-a view the observatory does not get. On Feb. 5 the observatory will feature a half-hour lecture on "The Digital Universe," followed by a weather-permitting view of the sky through telescopes. The observatory opens at 8 p.m. the fifth and 20th of each month all semester-long. The building will switch to summer hours in May. For more information, contact Elizabeth Warner at (301) 405-6555 or warnerem[at]astro[dot]umd[dot]edu or visit www.astro.umd.edu/openhouse/index.html.